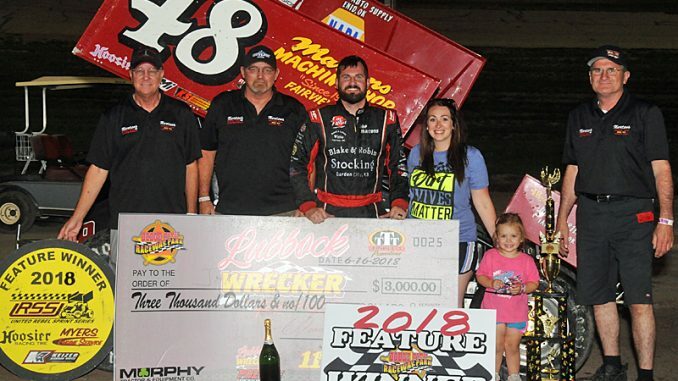 DODGE CITY, Kan. (June 16, 2018) – Fairview, Oklahoma’s Jake Martens survived a wild last-lap atop the 3/8-mile Dodge City Raceway Park clay oval to pocket more than $4,000 by winning Saturday night’s Second Annual Lubbock Wrecker Service DCRP vs. URSS 305 Sprint Car Nationals 30-lap championship feature event. Martens took the lead away from Brian Herbert and then kept Chad Koch at bay before escaping a last-lap slider from Jake Bubak to pocket $4,040 that included $1,040 in lap money along with the posted $3,000 winner’s share. Martens raced on to the stripe ahead of Koch and 15th-starter Luke Cranston for the lucrative payday aboard the Martens Machine Shop/Blake & Robin Stocking No. 48. While Martens cashed in. Jeff Kaup added another win in the IMCA Sport Modified ranks and Angel Munoz bested the IMCA Stock Cars. After heat race and qualifying race action for the 34-car Precise Racing Products DCRP Sprint Cars vs. United Rebel Sprint Series (URSS), Brian Herbert and Koby Walters led the way to the green flag as Martens gridded the feature field in third. Herbert gunned into the lead at the outset and paced the early rounds ahead of Walters and Martens, with Martens making his way into second soon after the first of just two cautions flew after nine laps for Lonnie Cox in turn two with the final caution flying four laps later. With Martens pressuring Herbert for the point, Chad Koch and Zach Blurton began dicing for position just behind them. Martens finally made his way into the lead on the 19th round with Koch following suit by racing into second on the same lap with a surging Luke Cranston taking over third from his 15th starting position on the 20th round. The stage was set for a dicey final ten laps with Martens, Koch, Cranston and Jake Bubak all in the mix for the win. With Koch making several runs at Martens exiting turn four, Bubak battled past Cranston for third on the 27th lap and started sizing up the leaders. With the white flag in the air, Bubak dove into turn one and slid past both Koch and then Martens to briefly take the lead. But as Martens drove off turn two, contact between the two cars sent Bubak looping into the infield. Koch of Wichita Falls, TX, was a close second with Ness City, KS, native Cranston rounding out the podium in third. After winning the “B” Main, Jason Martin charged through the field to capture a fourth-place finish with Zach Blurton rounding out the top five. Tony Bruce, Jr., crossed the stripe sixth with Herbert, Ray Seemann, Austin McLean and J.D. Johnson completing the top ten. Nick Haygood, Seemann, Cranston and J.D. Johnson won heat races with Koby Walters, Marten and McLean topping the Qualifying races before Martin bested the “B” Main. With Martens pocketing an extra $1,040 in lap money, others earning bonus money included Herbert ($920), Koch ($440), Walters ($340), Cranston ($160), Bubak ($60) and Blurton ($40). Woodward, Oklahoma’s Jeff Kaup cashed in on Freddy McCoy’s misfortune to post his second IMCA Sport Modified win of the year at DCRP. With Kaup gridding the feature field ninth, McCoy gunned into the lead from the front row outside and distanced himself from the field. Kaup worked his way through traffic and finally made his way to second by the eighth round of the 15-lapper but trailed McCoy by nearly a full straightaway. McCoy’s lead was erased when a caution flew after 11 laps, with Kaup assuming the point when McCoy exited the track with mechanical woes. Kaup raced on to the stripe ahead of Kaleb Roach with Bart Baker, Brian May and Adam Stenzel rounding out the top five. In the IMCA Stock Cars ranks, Angel Munoz raced through the field to become the first repeat winner of the season in the 15-lapper. While Munoz raced from ninth, Chris Oliver set the pace for a dozen laps until Munoz rallied by on the top side en route to victory lane. Michael Pepper raced into second with Oliver settling for third. Greg Schell and Dusty Witthuhn rounded out the top five. Action resumes at Dodge City Raceway Park on Saturday night, June 3, with the DCRP Mid-Season Championships featuring the Precise Racing Products DCRP Sprint Cars, IMCA Modifieds, IMCA Sport Modifieds, IMCA Stock Cars and IMCA Hobby Stocks. Heat One (8 Laps): 1. 1-Nick Haygood, 2. 33-Koby Walters, 3. 48-Jake Martens, 4. 83-Austin McLean, 5. 9d-Lance Davis, 6. 17s-Chad Salem, 7. 21x-Taylor Velasquez, 8. 31m-Eric Mathews, 9. 11x-Jason Martin. Heat Two (8 Laps): 1. 72-Ray Seemann, 2. 97-Brian Herbert, 3. 35k-Chad Koch, 4. 2b-Brett Becker, 5. 0-Steven Richardson, 6. 11k-Tyler Knight, 7. 18-Brandon Sprott, 8. 33k-Aaron Ploussard, 9. 24-Cody Hays. Heat Three (8 Laps): 1. 49x-Luke Cranston, 2. 2J-Zach Blurton, 3. 45-Lonnie Cox, 4. 224-Tony Bruce, Jr., 5. 49-Kris Moore, 6. 50-Jed Werner, 7. 51r-Ross Essenburg, 8. 7-Shane Sundquist. Heat Four (8 Laps): 1. 98-J.D. Johnson, 2. 74b-Jake Bubak, 3. 95-Buddy Tubbs, 4. 10-Jordan Knight, 5. 42-Chris Crowder, 6. 8J-Brandy Jones, 7. 4-Todd Plemons, 8. 911-Ty Williams. First Qualifier (10 Laps): 1. 33-Koby Walters, 2. 97-Brian Herbert, 3. 0-Steven Richardson, 4. 11k-Tyler Knight, 5. 1-Nick Haygood, 6. 9d-Lance Davis, 7. 49x-Luke Cranston, 8. 911-Ty Williams, 9. 17s-Chad Salem, 10. 33k-Aaron Ploussard, 11. 24-Cody Hays, 12. 8J-Brandy Jones. Second Qualifier (10 Laps): 1. 48-Jake Martens, 2. 45-Lonnie Cox, 3. 72-Ray Seemann, 4. 74b-Jake Bubak, 5. 2J-Zach Blurton, 6. 2b-Brett Becker, 7. 4-Todd Plemons, 8. 42-Chris Crowder, 9. 49-Kris Miller, 10. 51r-Ross Essenburg, 11. 7-Shane Sundquist. Third Qualifier (10 Laps): 1. 83-Austin McLean, 2. 35k-Chad Koch, 3. 224-Tony Bruce, Jr., 4. 10-Jordan Knight, 5. 11x-Jason Martin, 6. 50-Jed Werner, 7. 98-J.D. Johnson, 8. 21x-Taylor Velasquez, 9. 18-Brandon Sprott, 10. 95-Buddy Tubbs (DNS), 11. 31m-Eric Mathews (DNS). “B” Main (12 Laps – 4 Transfer): 1. 11x-Jason Martin, 2. 21x-Taylor Velasquez, 3. 911-Ty Williams, 4. 51r-Ross Essenburg, 5. 49-Kris More, 6. 7-Shane Sundquist, 7. 3k-Aaron Ploussard, 8. 24-Cody Hays, 9. 42-Chris Crowder, 10. 18-Brandon Sprott, 11. 17s-Chad Salem, 12. 95-Buddy Tubbs (DNS), 13. 8J-Brandy Jones (DNS), 14. 31m-Eric Mathews (DNS). “A” Main (30 Laps): 1. 48-Jake Martens (3), 2. 35k-Chad Koch (4), 3. 49x-Luke Cranston (15), 4. 11x-Jason Martin (21), 5. 2J-Zach Blurton (8), 6. 224-Tony Bruce, Jr. (9), 7. 97-Brian Herbert (1), 8. 72-Ray Seemann (7), 9. 83-Austin McLean (5), 10. 98-J.D. Johnson (12), 11. 1-Nick Haygood (13), 12. 11k-Tyler Knight (11), 13. 33-Koby Walters (2), 14. 911-Ty Williams (23), 15. 10-Jordan Knight (16), 16. 50-Jed Werner (19), 17. 0-Steven Richardson (14), 18. 74b-Jake Bubak (6), 19. 51r-Ross Essenburg (24), 20. 21x-Taylor Velasquez (22), 21. 9d-Lance Davis (17), 22. 45-Lonnie Cox (10), 23. 2b-Brett Becker (18), 24. 4-Todd Plemons (20). Lap Leaders: Brian Herbert 1-18, Jake Martens 19-30. Heat One (8 Laps): 1. 3s-Adam Stenzel, 2. 8-Brian May, 3. 21-Joey Maupin, 4. 21b-Rayce Hacker, 5. 5r-Kaleb Roach, 6. 10-Alex Wiens, 7. 65-Kohl Ricke, 8. 10T-Toby Witthuhn. Heat Two (8 Laps): 1. 4-Freddy McCoy, 2. 18-Kyle Wiens, 3. 92-Jeff Kaup, 4. 4p-Daylon Bergeron, 5. 7-Jarett Lunow, 6. 37-Bart Baker, 7. 12d-Brad Johnson. “A” Main (20 Laps): 1. 92-Jeff Kaup, 2. 5r-Kaleb Roach, 3. 37-Bart Baker, 4. 8-Brian May, 5. 3s-Adam Stenzel, 6. 4p-Daylon Bergeron, 7. 18-Kyle Wiens, 8. 12d-Brad Johnson, 9. 65-Kohl Ricke, 10. 10-Alex Wiens, 11. 21-Joey Maupin, 12. 21b-Rayce Hacker, 13. 4-Freddy McCoy, 14. 7-Jarett Lunow. DNS: 10T-Toby Witthuhn. Heat One (8 Laps): 1. 3-Chris Oliver, 2. 10-Dusty Witthuhn, 3. 89-Greg Schell, 4. 22p-Michael Pepper, 5. 25x-Troy Burkhart, 6. 52-Larry Baird, 7. 771-Steve Blunk, 8. 01-Jesse Smith. Heat Two (8 Laps): 1. 2m-Angel Munoz, 2. 97x-Ondre Rexford, 3. 33-Marlin Hogie, 4. 52T-Travis Baird, 5. 17m-Shannon Maughlin, 6. 57-Will Bauer, 7. 40-Les Martens. “A” Main (15 Laps): 1. 2m-Angel Munoz, 2. 22p-Michael Pepper, 3. 3-Chris Oliver, 4. 89-Greg Schell, 5. 10-Dusty Witthuhn, 6. 17m-Shannon Maughlin, 7. 25x-Troy Burkhart, 8. 33-Marlin Hogie, 9. 52T-Travis Baird, 10. 52-Larry Baird, 11. 40-Les Martens, 12. 771-Steve Blunk, 13. 97x-Ondre Rexford, 14. 57-Will Bauer, 15. 17-Ryan Keller. DNS: 01-Jesse Smith.